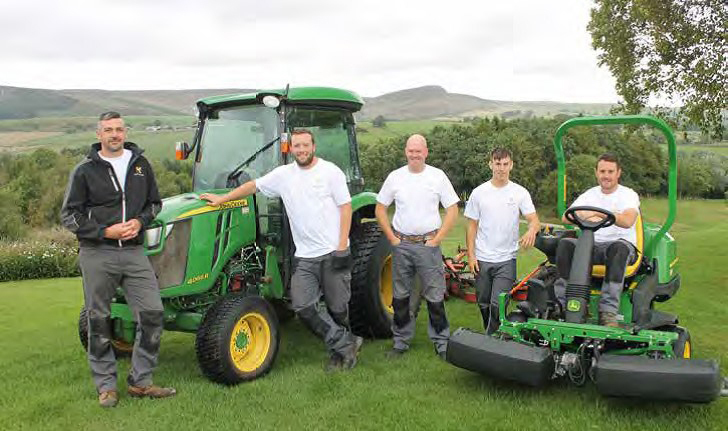 To the fore in sector awards – the greenkeeping team at Skipton Golf Club. Head greenkeeper Ian Brown is pictured left. Skipton Golf Club’s head greenkeeper Ian Brown and his hard-working team won through to the finals of the British and International Golf Greenkeepers Association (BIGGA) 2019 Awards for their outstanding contribution to the project to remodel the course. The team was nominated by the club for the high profile awards, staged as part of BIGGA’s recent Turf Management Exhibition in Harrogate Convention Centre. It was attended by more than 5,000 greenkeepers, trade members, club managers and other representatives, who came together to network and share the latest education and innovation opportunities at Europe’s premier turf management event. The awards were hosted by the BBC’s Naga Munchetty and both the Skipton greenkeepers and the club said were delighted and honoured to finish as runners-up in the 2019 Greenkeeping Project of the Year. When the Environment Agency informed Skipton GC of its intention to build a 14-metre high dam across the club’s 16th green and 17th hole as part of the town’s Flood Alleviation Scheme, the greenkeeping team, led by Ian Brown, undertook to completely remodel the existing course with the ambition of making it one of the premier courses in Yorkshire. Working alongside golf architect David Jones and contractors MJ Abbott and Oliver Sugden, the layout of the course was drastically altered to suite the land available and to improve upon the existing course. The project also saw the construction of a new maintenance facility for the greenkeeping staff. Despite the cold, wet conditions at the start of the year, followed by the driest summer on record, Ian and the team were able to achieve their goal of preparing the course for its launch at the beginning of August last year to coincide with the club’s milestone 125th anniversary. This goal was achieved due to Ian and his team’s willingness to start work early and come in on their days off to complete work that included the planting of 60 trees and 200 saplings, and the growing-in of three new greens and fairway areas. Former Skipton GC chairman Michael Hirst praised Ian and his team for their professionalism and pride in the course. “Ian leads with example and has been a tower of strength throughout the transformation,” he said.